It’s been well over a year since I last reviewed a Goldfish Tea and over a year and a half since I last reviewed an Oolong, so today I’ll be doing both of those things. I do really enjoy the esoteric teas Goldfish offers, but unfortunately, living without a car or a lot of spending money doesn’t really lend itself to making the journey to Royal Oak very often. The name Wuyi Yancha Goldfish has chosen here, is actually itself a category of Oolong varietals from the Wu Yi mountains of Fujian province. You may have heard me mention Fujian a lot on this blog. Fujian is the breadbasket of Chinese tea production with well over 500 different teas, some of which date back at least 1,600 years. 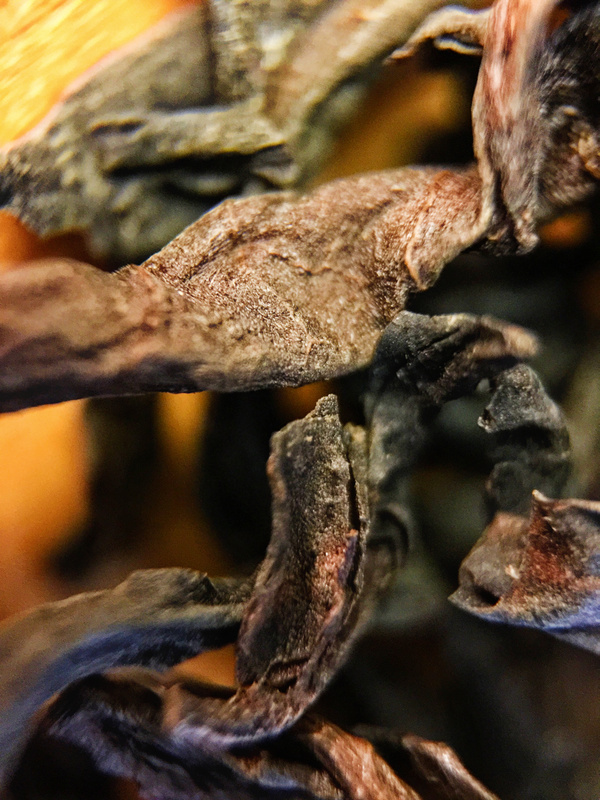 The Yancha Oolongs of Wu Yi Shan are the most sought after Chinese Oolongs, rivaling some of Taiwan’s best Pouchongs. Also known as “Wuyi Rock tea”, the oldest and rarest sprout from the ground and cliff-side in a cluster of branches, each baring only a very small number of leaves in what is called “single trunk” bush varieties. Many of these single trunk bushes date back more than 50 years. The four most famous Yancha’s are Da Hong Pao (Royal Red Robe), Bai Ji Guan (White Cockscomb), Tie Luo Han (Iron Arhat) and Shui Jin Gui (Golden Water Turtle). I’ve positively identified Goldfish’s “Wu Yi Yan Cha” as Shui Jin Gui, a fairly rare sub variety. I’ve previously reviewed the more common, Da Hong Pao. Bai Ji Guan is extremely rare and I’ve never come across it. As you may recall, I actually cannot drink Oolong tea (ironic, no?). Like many who suffer from Irritable Bowel Syndrome, my digestive track is extremely sensitive to the high-octane oxidation of Oolong (the only style of tea that’s oxidized twice) and today’s tea is no exception. As luck would have it, I’ve run out of the Jocilyn-friendly gluten-free/low gas food in my pantry and have needed to start ingesting real food until my next pay check–I may as well enjoy a variety of poisons while I’m at it. In terms of aroma, Shui Jin Gui is overall fairly similar to many Chinese Oolongs, but differs in that it possesses both rock sugar and buttered toffee aspects. Shui Jin Gui’s liquor is an immaculate Aztec sunset *genuflects in child’s pose*. In texture, it’s a great deal thinner than i would have thought, with a low-to-very low grit. In flavor, a light roast English toffee (if a bit less sweet) with a minute corn husk aftertaste. Recommended… barely. If you’re an Oolong-lover, you will definitely get into Shui Jin Gui. If not, at least it’s very pretty. Wu Yi Yan Cha (Goldfish) ~ loose leaf by Jocilyn Mors is licensed under a Creative Commons Attribution-NonCommercial-ShareAlike 4.0 International License. Wu Yi Yan Cha (Goldfish) ~ loose leaf Macro 21x by Jocilyn Mors is licensed under a Creative Commons Attribution-NonCommercial-ShareAlike 4.0 International License. Wu Yi Yan Cha (Goldfish) ~ spent by Jocilyn Mors is licensed under a Creative Commons Attribution-NonCommercial-ShareAlike 4.0 International License. Wu Yi Yan Cha (Goldfish) ~ liquor by Jocilyn Mors is licensed under a Creative Commons Attribution-NonCommercial-ShareAlike 4.0 International License.